I sent Cal Thomas a link to this site and we exchanged several emails over the weekend. He mentioned several names I haven't heard in about 40 years -- staffers who served with us including Les Blatt who went on to be a network news producer and Paul Kerivan whose car Cal used to borrow for his monthly PX and commissary run . Also CG Wells who Cal says died some time ago. If I remember correctly, CG was the news director of the Armed Forces Press, Radio and TV Service in New York, and a real professional. When I told Cal that I am currently hosting the local segments of "All Things Considered" on Tucson's NPR station, he suggested tongue-in-cheek that I have him on the show. "We could choke the audience with nostalgia," he wrote. I remember the name CG Wells, but can not put a face on it at this late date. He wasn't the news director, however. That position was held by Bill Murray. I remember C. G. He was the head of the production department. He was no youngster when we were there - he had to be in his fifties, as I remember him. He was tall (OK, to me EVERYONE was tall), slim, bald or balding, with a mustache, as I recall, and always a gentleman. I SPENT 2 TOURS OF DUTY AT AFNT-CCK IN CCKAB NEAR TAICHUNG, TAIWAN IN 4 YEARS (FEB'69 AND MAR'71). I WAS A STAFF ANNOUNCER THEN STATION MANAGER MY 2ND TOUR. YOU WERE THE OIC MY 1ST TOUR THEN OWEN RESWEBER WAS OIC DURING MY 2ND TOUR. MY WIFE OF 35 YEARS IS FROM PULI, TAIWAN. Happened to be looking at a website about the Taipei Air Station and ran into a post about a young woman who was looking for information about her grandmother. To my surprise, grandma was Mary Wang, our receptionist at the station. I contacted the seeker and sent along this picture. She was ecstatic. I also put her in touch with Rosalie Fogel, Larry's widow who was also from Taiwan. Granddaughter wrote: "I will pass this information on to my mother. My grandmother passed away when my Mom was 12, so she also has very few memories of her. Again, thank you so much. The information that you have provided is invaluable to my family and I, and you've given me much more than I've been able to collect from anyone, or any other source." 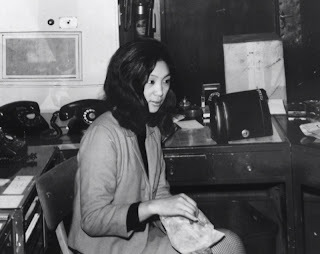 By the way, Mary Wang was one of the first TV personalities in Taiwan. She had a fashion and sewing program and was featured in a cover story in the local TV guide. You never know how our dabbling on the internet touches lives.